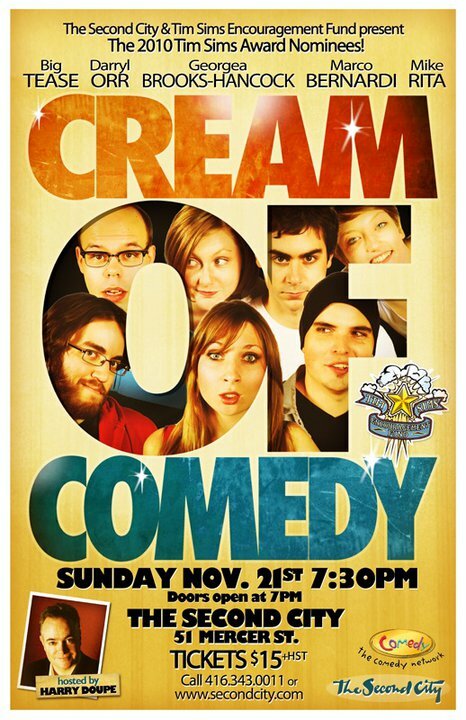 Cream Of Comedy 2010 – Now with 100% more performance pictures!! Last night I had the pleasure of attending and taking some shots at the Cream Of Comedy 2010 competition. The night was everything I hoped it would be, with each one of the comedians delivering a top notch set of comedy. In the end, it was Mike Rita who walked away with the big prize. Couldn’t have happened to a nicer guy. If you missed out on the show this year I highly recommend you keep an eye out for it next year. Its always an outstanding night and the very best way to see the cities most exciting comedians. 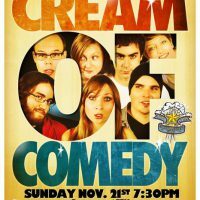 Five of the funniest new acts in Toronto’s comedy scene will be featured in Cream of Comedy on Sunday November 21st , when one of them will be crowned the winner of the 2010 Tim Sim’s Award, and take home a $5,000 cash prize as well as a scholarship to The Second City Training Centre. The winner will also have an opportunity to write and star in a comedy short to air on The Comedy Network. The evening will be hosted by Harry Doupe, whose has performed at major events and venues across the country, and whose “State of the Industry Address” is a highlight of the annual Canadian Comedy Awards. Now in its 15th year, The Tim Sims Award is presented annual by The Tim Sims Encouragement Fund (www.timsims.com), which was established in memory of a beloved Second City alumnus to order to support and promote promising comedic performers in the early stages of their careers. This year’s jury-selected nominees include sketch comedy troupe Big Tease, and stand-up comics Darryl Orr, Mike Rita, Georgea Brooks-Hancock, and Marco Bernardi. Come discover new talent, cheer on your favourite, and find out who will be selected as the 2010 Tim Sims Award recipient. It should be a spectacular show. Think about it… The Very Best young talent of the year all on one stage. Ridiculous. Tell your friends and readers about the awesomeness that is Fresh Meat 2010 so that we can do it again every year.